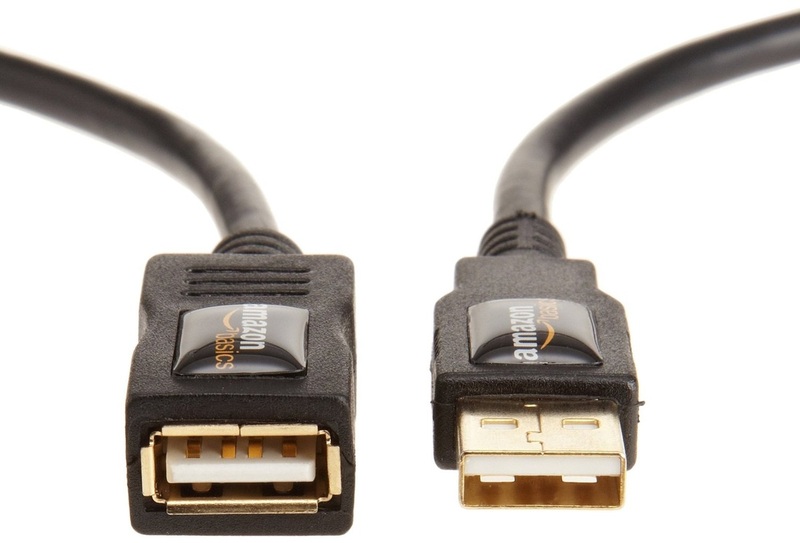 This is a specialist cable that allows connection between a Smartphone or other device with a USB Type C 3.1 port and an HDMI port on a TV or (in my case) projector. Being familiar with aLLreLi quality from the past, I was happy to give this product a try. 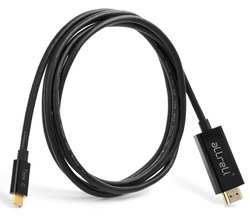 The cable is supple but sturdy and a useful length (1.8 m), and has gold-tipped connectors, which I have found to be consistently better than plain metal ones. In use the cable performs perfectly, both audio and video signals transmit cleanly without lag or disturbance and the image quality is excellent. Operation is intuitive and no drivers are necessary. A good quality cable that I hope will last well in time. This good-looking extension cable has an air of solid quality about it. I had not heard of the brand FRiEQ until I was asked to test-drive a couple of their products. I am not an expert but I do value quality in sound and music reproduction, so my review is strictly from the viewpoint of a moderately educated consumer. The cable is contained within a smart green-and-black pleated nylon sleeve, which recalls sturdy camping ropes, and makes it easy to identify among other wires. At either end are a male and a female gold-plated connectors. I had a chance to appreciate the huge difference that gold-plated connectors make when I switched to one to connect a printer to my previous computer. It is an extension cable designed to add 4 feet (or 1.2m) to a range of equipment which accepts 3.5mm plugs. That would include most current mp3s, media players, iPhones, iPads, and my Kindle Fire HD. The cable specs are impressive and it appears that no detail was overlooked in the conception and manufacture. I can confirm that the stiffness of the cable prevents tangling, the connectors give a solid and secure attachment and waggling the length while in use does not result in any crackle or disturbance. 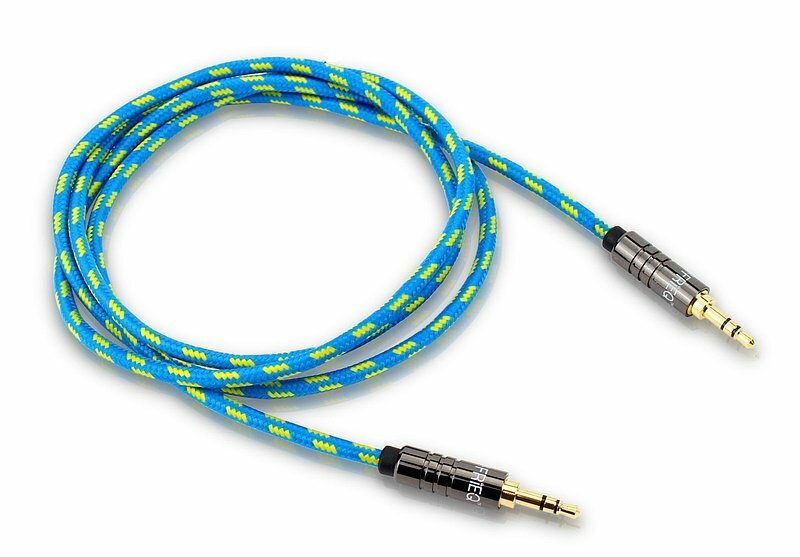 The sound conducted is clean and clear, and the performance of this cable is actually superior to that of my original cables. In my tests, I connected an mp3, my Kindle Fire HD and a desktop computer to a home stereo system, and to a variety of wireless speakers. In each case, sound reproduction was excellent, clear and without distortion. I really like the performance of this product which appears to be very durable, extremely well designed and constructed with top quality components. My musician husband has cast an acquisitive eye over these cables and I think they will soon be put to good use in his home studio set-up. Sample item provided for review. FRiEQ is a new name to me, but then I am not an expert in electronics components. I am simply a music lover who likes to listen to the best quality sounds I can. When I was offered a chance to try this product, my aim was simply to test the functionality and performance of this cable, designed to connect audio devices to a home (or car) stereo system. Right out of the box, the cable impresses with a built-to-last nylon sheathing and two gold-plated male plugs. I rate gold-plated connectors highly as I had ample opportunity to observe the huge difference they made when used to connect a printer to my old computer. All the claims made about this cable are borne out, as far as I can tell. The stiff nature of the cable makes tangles unlikely, the design of the plug fits the intended receptacles to perfection with a solidity that is reassuring. 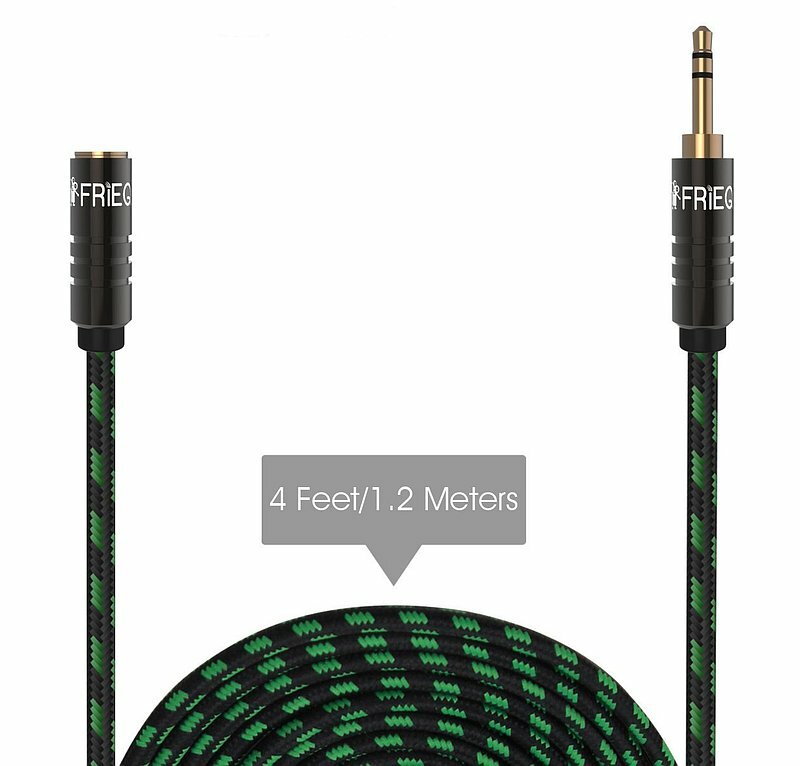 The length (4 feet or 1.2m) is very convenient and, the most important thing for me, the sound quality is outstanding. Better and clearer than that of the original cable, in most cases. Visually, the yellow-and-turquoise pattern ensures that it stands out from the usual black wires. For my evaluation, I connected an mp3, my Kindle Fire HD and a desktop computer to a home stereo system, and to a variety of wireless speakers. In every configuration, sound reproduction was excellent, clear and without distortion even if the cable was waggled. This is a quality item, incorporating superior engineering, that appears to be extremely durable, and certainly performs flawlessly. My musician husband has cast an acquisitive eye over these cables and I think they will soon find permanent employment in his home studio set-up. I wanted a longer USB cable to connect a printer to my desktop, which sits on a different table a little distance away. In the past, I replaced a malfunctioning printer cable with one equipped with gold-plated connectors and I knew from this experience that quality makes a big difference, so I looked specifically for gold-plated connectors and not the cheapest cable I could find. I am very happy with this purchase. Although it's only a piece of wire, it is essential to operate my printer. 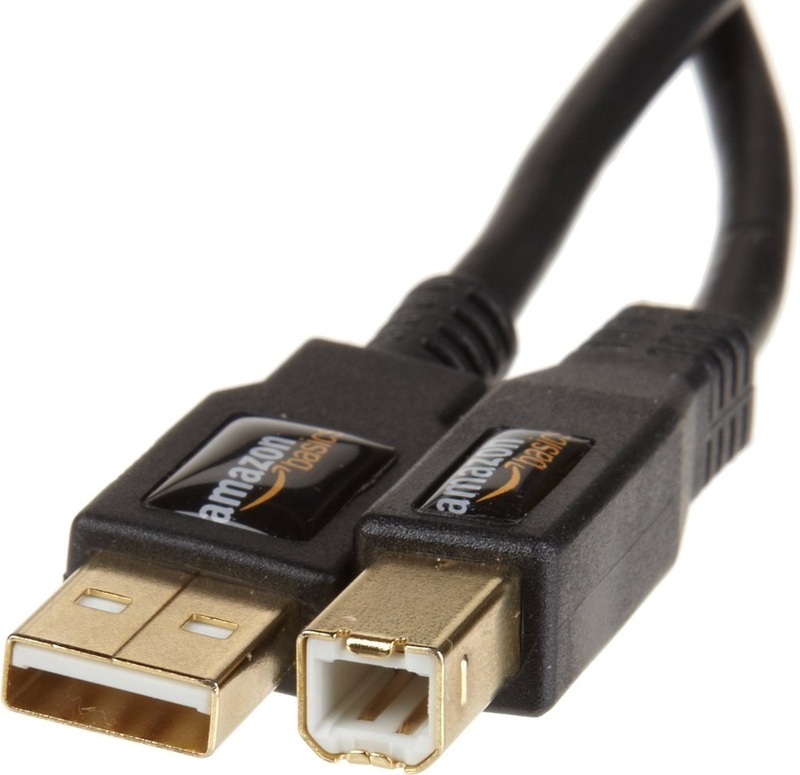 The AmazonBasics cable is sturdy yet flexible, the connectors have a look of quality and, unless it's a coincidence, my oldish printer seems to work more reliably. I had previously bought a 1.8 m cable for my camcorder and all I have said above also applies to that cable. A very good product at an affordable price. The product was well packaged in Amazon's environmentally-friendly cardboard. I needed to replace a cable connecting a camcorder to my laptop. I had previously replaced a malfunctioning printer cable with one equipped with gold-plated connectors and I knew from my own experience that quality makes a big difference, so I was looking specifically for gold-plated connectors. I am very happy with this purchase. I know it's only a cable, but it is also the means of transferring my videos to my pc and, without it, I cannot access my footage. The cable is sturdy and flexible, the connectors have a look of quality and my data is being transferred successfully. I also bought a 3 m cable to connect a printer and all of the above also applies to that cable. A very good product at an affordable price. The packaging provided adequate protection and is environmentally friendly. USB hubs have really come into their own since the development of the 3.0 standard which allows unprecedented speeds of data transfer. However, these small, indispensable units seem to be mostly designed to work with laptops. With their short to extremely short cables, they are great sitting on your desk beside your portable beast but pretty useless if your remaining free USB port is at the back of the desktop tower, or your one fast 3.0 port is low on the side, as in my case. This USB 3.0 extension cable is designed to integrate perfectly with the new generation USB hubs, supporting speeds of up to 5GB per second (and most likely limited by the device's own capabilities). It is a generous 1.5 metre long and has a feel of quality about it. It is flat (almost impossible to tangle), solidly made (the maker talks about double shielding of aluminium and copper sheath) and is said to be suitable for continuous daily use. The beautiful bright blue colour makes it stand out in a tangle of black and white wires. In my trials so far, the claim about speed is fully borne out. I have also noticed that charging of small items like mp3 players is very fast indeed. The connectors at each end of the cable are solidly and smoothly made and promise reliable operation. 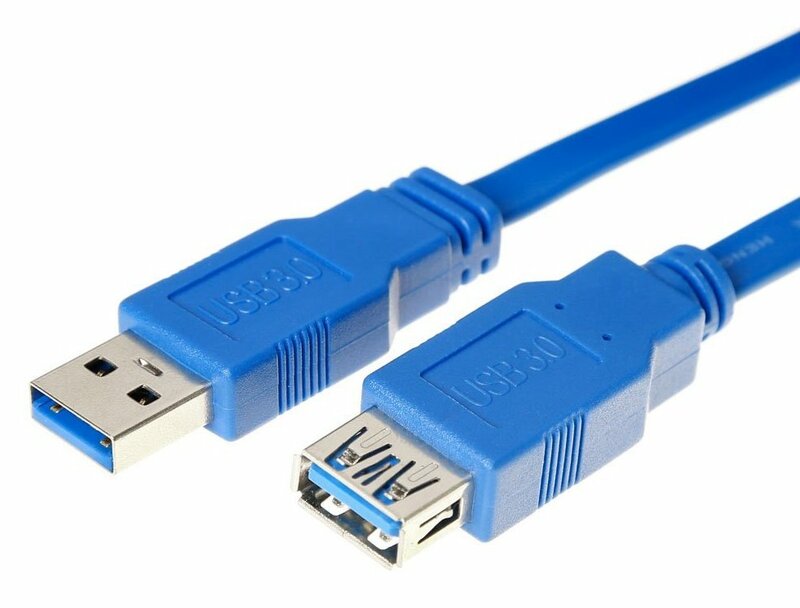 As with all Inateck USB 3.0 products I have evaluated so far, there is full backward compatibility with 2.0 and even 1.0 USB connections, just don't expect the same blinding speed. All Inateck products I have tried have been of consistently superior quality, so I am very happy that they sent me this sturdy cable to test and review.